It’s mid-summer. We started strong, selling extra strawberry plants and a few raspberry starts, planting a garden, putting in some mushroom patches. John Hatch brought a barrel of biochar and a pint of wood vinegar, with instructions, and I used some of each. I set up a watering system, to water plants every day, and John came out and watered them and the house plants. Perry Post, who has dreams for this land, did a lot of work on the things mentioned above, then got busy at home. I went away to the conference – in midsummer: what kind of farmer does that? When I came back the critters had eaten most of the plants I’d started near the house, and reed canary grass was stronger than anything. 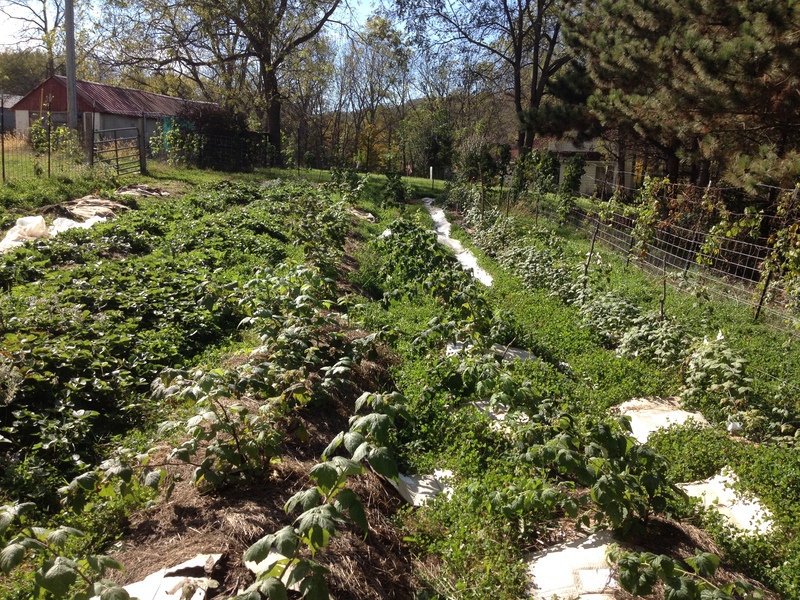 Fast forward: some watering, some weeding. Few tomatoes (too close to the box elder, maybe? ), many black raspberries, and some red and yellow ones. The strawberries are starting their second round. There are more vegetables near the house than I thought. I’m trimming back the raspberries. AND…..
little trees. Copying the one built by Peter and Keith, my permaculture teachers. I spent an afternoon with Nick, experimenting and planning. Then two days with students from the Heart of the Heartland program – they spent six weeks learning about small farms, having workshops and working on farms. They’re in the photo, and they were really a lot of fun. (On the rainy day they also cleaned my barn/garage, which desperately needed it. DEER FENCE SATURDAY AUGUST 5. We have a half day, 1-5, to continue building the deer fence. It would be really wonderful to finish it – many hands and all that. If you have questions, call me at 507-384-8541 or email me at shodo.spring@gmail.com. If you know you want to come, just tell me – the same way, or by signing up on the Facebook event page. We are in a new world. We don’t yet know what will come out of it. At first I watched the news in horror. Then I noticed the uprising of resistance, of compassion in ordinary people, of more news from the news media. I also listened to the people – indigenous, Black, and others – who said “You didn’t know that America was racist? Really?” There’s a long view to be had here, and it’s a good time to listen. What shall we do? This is more like a marathon than a sprint. Carolyn Baker writes about the need for resistance, and inner work, and community, and cultivating beauty and joy. Even though it’s an emergency for every refugee turned away and every immigrant deported, even though it’s an emergency with climate change and the poisoning of the planet, we still need to take the long view. And decide where our proper place is, each one of us. How did Norway successfully resist the Nazis? Reading George Lakey’s narrative, I was encouraged. What would I have done, could have done, in any of the genocides of history, and what will I do now? The advice to me personally has been increasingly clear and intense: take the time to go deep, to strengthen myself. Take a leadership role later. Do not get distracted by every petition, every issue – and back away from the news. The emergencies call out to me, and people ask me to help. And I’m tending to my own rest, nutrition, meditation time, and prayer time. So this is my primary activism right now, as I allow myself to go deeper and have more to offer. The Advisory Council is a treasure. The vision of Mountains and Waters Alliance is going beyond the human realm to gather the strength of all the beings of earth. It is too late for human ingenuity alone to stop climate change – let alone reverse it as we need to do. But we keep forgetting that we are not alone, and that we don’t have to do this task alone. Rather, we need to abandon our position at the top of the heap, where everyone and everything else on the planet is just here for us to exploit. We need to join the community of life. It’s now an emergency. Religious people have known we are not alone. But among religions of the world, the sense of ourselves as part of the community of life belongs to Buddhists, many indigenous religions, and I’m not sure who else. Many forms of most religions place humans right below God, above the rest of living beings. And that is the problem that causes us to exploit, use, and abuse others for our own convenience. I can’t tell you why the concept of stewardship has failed so badly, but look around and see. There is so much I do not know – I’m following a thread through a maze. Donations are always helpful. I’m not actively campaigning for them right now – working on finding paying work and co-farmers. Prayer again. Whatever form that takes for you. 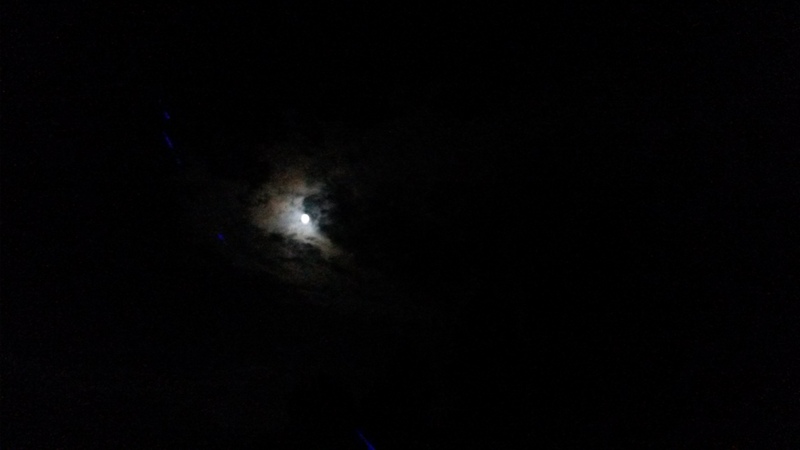 Two nights ago I was lying under the moon, casually talking with Lynn about a question close to us both. What can be done, what can a person do, about the death-wish of our culture? Is there any way to stop the rushing toward the cliff of climate change – or the killings of innocent people, the revenge killings, the deaths of refugees, the escalating hate and blame and violence. It was good to have that conversation under the sky, not in a room or over the internet. I’m two days away from the news, and about to spend another ten days on retreat, in company with people of shared values and with mountains, earth, grasses, butterflies, sky. Two weeks ago I came back from checking the woods after a storm (fallen trees, no serious damage) to find people talking strangely on facebook – and finally checked the news and learned about the Dallas shootings. There have been more since. Death is in the air. I have not known what to say. In the past, when I could, I paid respect to those killed as well as to ordinary deaths by placing names on the altar and chanting for them. I stopped. There are too many. Perhaps I should be ready for violence in my own neighborhood – at the farm. (Last night Conor thought someone might have broken in to the basement. I don’t think so, but can’t know for sure. A flurry of calls and texts, and I simply have to let it go. If I don’t hear from him, things are okay.) Perhaps the mind of separation and violence will win in my own mind. “Hatred never ceases with hatred. By non-hate alone does it cease.” Buddha, The Dhammapada. And I continue learning to listen to plants, rocks, valleys, clouds, asking them to help that flourishing of Life. As I walk or hike in these different landscapes (Colorado now), their voices are increasingly warm and strong. I make commitments to teach, hoping others will welcome what I am beginning to learn, replacing human hubris by equal companionship with other beings. As Buddhism has always taught. 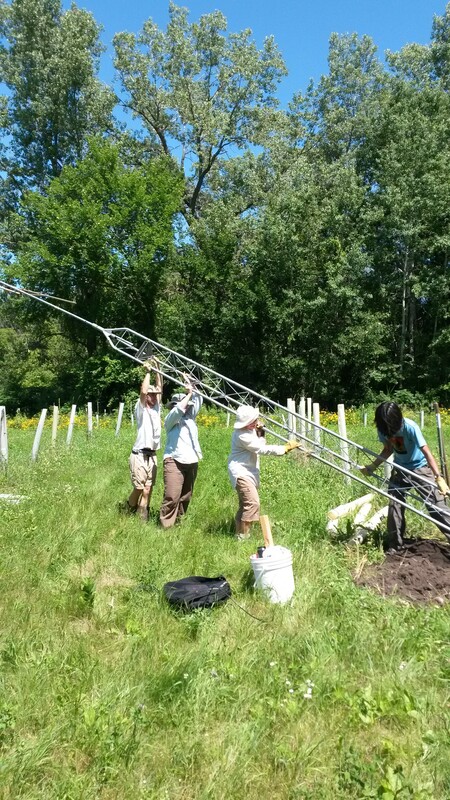 On our last volunteer day, we put up a raptor perch in the orchard. Storms have taken down many trees, and coming projects will include a lot of cutting firewood, taking down vulnerable trees (to protect the driveway), and otherwise dealing with the storm. The bridge, which was thought to belong to the neighbor, actually is part of our land. I finally hired a surveyor to settle it, and we own even more than I thought. 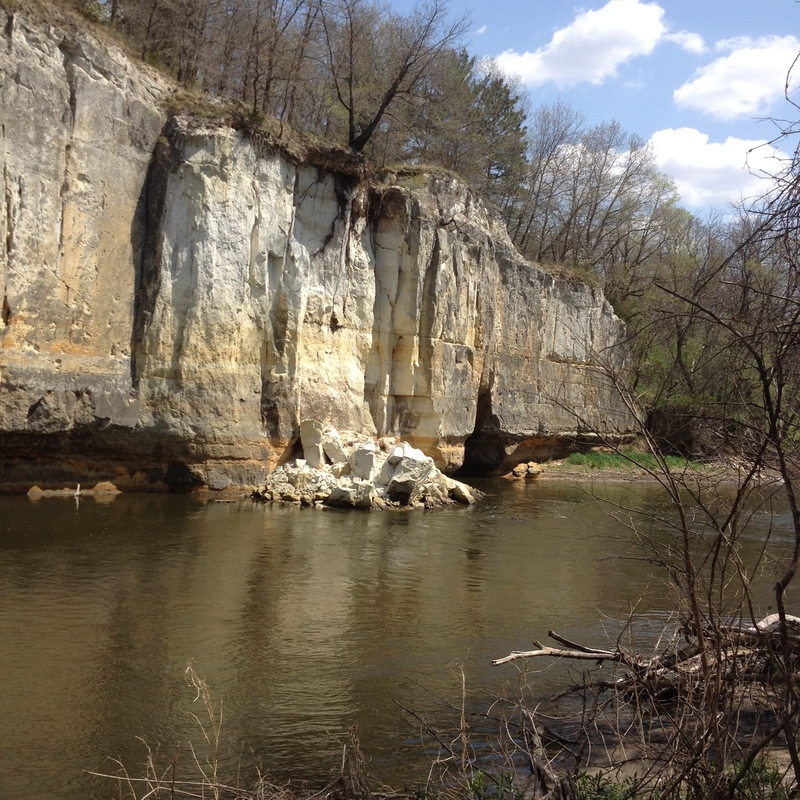 We’ve enjoyed having easy access to the wild lands and the river. Conor Millard, intern, is there while I travel, taking care of plants and things. Paul Carrington-May comes several hours per week to help with gardens, orchard, berries, mowing, or whatever we need. We sat zazen together morning and evening, while I was there, and will again after I return. We went to Faribault Farmer’s Market together,even though there’s not much produce right now. Next volunteer times (besides whenever it works for you): August 12-14 (afternoons), and then look here. And we are looking for a farm manager. Someone who wanted to be part of the residential community here would be great, but I’m happy to discuss any option. The manager would be sent to Land Stewardship Project’s Farm Beginnings training – because we need both the business part and the farming part. 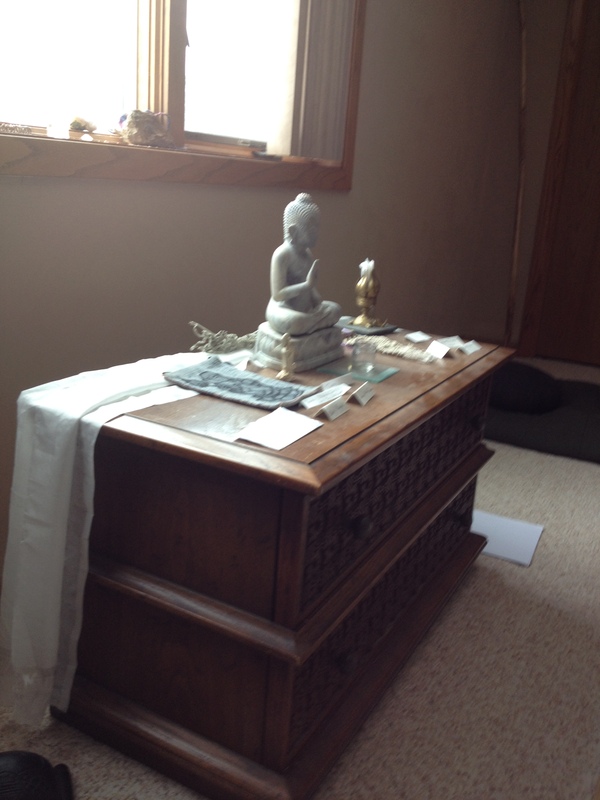 Northfield group continues first, third, and fifth Wednesday each month, 6:30-8:30pm, at Northfield Buddhist Meditation Center in Division Street. In September we’ll start a new topic. Retreats and sesshins are posted in the last blog post and here. The solar panels are up and running. A small grant request is being considered, which would help us get a real website and seriously improved communications. An office manager (Juli Dupont) and bookkeeper are making their way through the maze of expenses and donations, creating workable Quickbooks files so it will be easier in the future. You may have noticed that we’ve increased our social networking. And, at the core, I continue to be a student of the land and a student of Life, while giving more talks and meeting more people. In the middle of the (so-far) slow collapse of western civilization, there is warmth, humanity, intimacy, liveliness. May these flourish. Volunteers are very welcome. 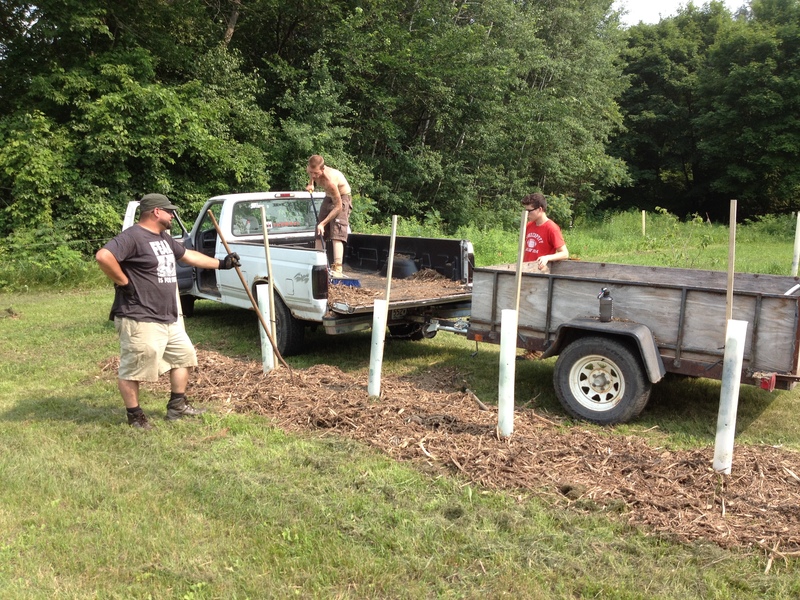 In addition to farm and woodland volunteers, carpentry or chainsaw volunteers, there could be help with social networking, grantwriting, or other organizational matters. I’m looking for a farm manager – see above. $130 Gathering of the Guilds – Midwest Permaculture gathering just an hour away from us – ($65 each for me and Conor, for the weekend August 26-28). I’m presenting workshops there. up to $75 Women’s Spirituality Conference at Mankato October 22-23 – as a workshop presenter, I attend free but they do not pay for travel, lodging, or meals. My workshop is scheduled on two days, requiring an overnight, presumably camping. To get the farm working as a business – training for me and a manager, $1600. LSP offers this 2-year training program regularly, but this is the first time it’s offered in Northfield. It would help us get on our feet financially. ($1400 early commitment plus estimated $200 gas over the 2 years.) There’s a chance that we’ll break even on the farm this year if we sell produce, but long term is very important for supporting our lives and work. Other expenses for interns (increased internet, travel, etc) and it sure would be nice to give a stipend to people who work so hard. Up to $200 each per month. Would make it possible to have more interns at one time, not just more work but more teaching and learning as well. Part time office manager – currently about $1000/month, will decrease once the backlog is covered. Farm manager – unknown, depends on skills and whether they need to pay for housing. Currently I just borrow from my savings when money gets tight. There’s not yet a plan to repay that borrowing, but obviously it can’t continue too long. You can use this button to Donate , or see other options on the Contact page. Please feel free to designate your contribution for one of the above. Let me know whether you want it to be tax-deductible through our fiscal sponsor. Special thanks to the woman who has pledged $400/year, unasked, and to all the other past donors. May our hearts be whole and joyful. Yesterday Conor and I spent the afternoon in the strawberry patch. We dug up plants and moved them to an open space (that Paul had weeded) in the next row. 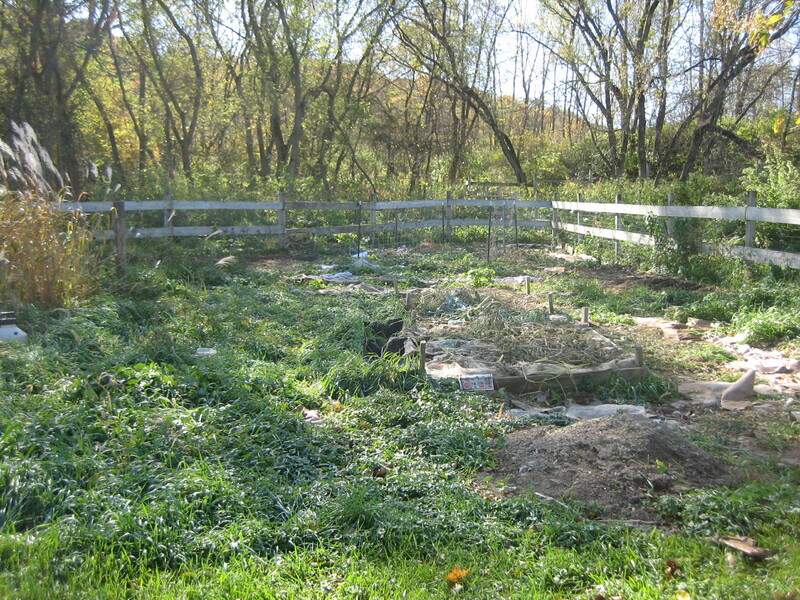 We dug up diseased plants (mites, I believe) and moved them to the sun garden – quarantined. We weeded, and we gathered pine needles to use as mulch. We stopped after doing one section fully; lots more to do next week. What I noticed is that you can’t do these things in a hurry. You have to slow down and be gentle with the plants. When I let go of my hurry, it was easy and pleasant. Today, Conor and Paul and I got compost and put it on almost all the potato plants: the newly planted, and the ones that are a foot tall and need to be covered. One pickup load, moved twice – in and out. We started in the cool of the morning, ended at 91 degrees – and then took naps in the cool house. Paul’s mother picked him up and told us there was a heat advisory out. I was unable to work; Conor cleaned the pantry where the last potatoes were either rooting or rotting. We talked about things to do when it’s too hot for outside – but the heat wave seems to be ending. In the outside world, England has decided to leave the European Union, and people are warning of dire consequences. I’m not following too closely. Things are falling apart – the question is how fast. At the compost site there was a man who looked way too old to be shoveling compost, and somehow we got to talking. He had been a stockbroker, and now has a hobby farm, invests in physical things, and warns me to be cautious of the city people who will come looking for food when the time comes. He also pointed out my tires, which need more air and were dangerously unstable on the ride home. There have been an unusual number of contacts from people interested in moving here. Some have appeared and disappeared, but others continue. So I’m looking at actually making more bedrooms in the wonderfully cool space downstairs. We had the flower essence workshop, with four students, and it was good. Lined up with my intention to form relationships with the nonhumans. In my “lessons” with the land, I’ve started to think of how to related to the grasses, to the mosquitoes (they want full attention, was Friday’s message), to the buckthorn (I promised it a grove somewhere on the hills – but there are two magnificent trees right in the cleared area, and I don’t know what to do.) Talking and listening with each of the many plants requires a calmness that I don’t seem to have. But I continue. And continue to sit zazen every morning. Going to Indiana for the Zen ceremonies was, on the one hand, wonderful, and was also what I did instead of sitting a three day retreat. Next month I actually go to a 10 day retreat in the mountains, where I don’t have to lead or cook or anything, and it looks like the deep rest that I need. We’ll be back on schedule in September. After the buckthorn pulling, there’s open space in the woods that’s just lovely, a space for listening and creativity. Most of the trees we planted are doing well, a few seem to have died, and I don’t know what happens next. This fall we get more ostrich fern and other smaller plants; I brought spicebush from southern Indiana to potentially plant as an undergrowth shrub to replace honeysuckle and buckthorn. And mosquitoes have finally appeared – late June – mercifully! There have been storms – almost tornadoes. The house is solid, and some of our elder trees have been hurt. I don’t yet know how to receive this damage. More and more it makes sense to operate in this way: accept what’s offered. Instead of controlling what gets planted, I respond to what comes up. So the gift tiger lilies are alive and probably will bloom next year. Last year’s oregano and mints are flourishing, as are basil and lovage and several others. The many little maple trees have no destination yet, but undoubtedly will go somewhere in the woods. Letting go is happening. My friends Rick and Beth came to learn flower essences, and are going to come Sundays to meet the herbs that live here, for herbal remedies. I just feel gratitude: what will make this work is people who have an independent interest in something here. I can be a learner and helper with them, instead of having to be in charge of everything. The solar panels are up and will be turned on this Tuesday. I start paying back the loan at that point, but also start making extra electricity to sell to the power company. I’ve written two small grant proposals, and bought domain names: Now you can search for MountainsandWatersAlliance as a .org or a .net, and for MountainsandWatersFarm.com, and they’ll all go to the blog which passes for a website. One of the grants is for help creating a real website. A volunteer offers to help write grants: extreme gratitude and relief. Because although I’m capable of learning things, there are too many things to do for me actually to learn and do them all. Part time office manager Juli is taking care of the numbers that I had been simply neglecting, and also helping me get more online presence. I’m still in charge of farm and conservation matters, the house, volunteers (I’m falling down here), teaching, Zen teaching, and the general direction of it all. And it’s time to check in with the Advisory Council about some of the steps forward. At two years, it seems like the hard survival part is done, and it’s possible to move forward into doing the work. Well, here is the rest of the year, almost. As well as I know. December is not clear. Saturday mornings are farmer’s market in Faribault, unless (like today) I have nothing to sell. Volunteer weekends are posted here. Northfield Zen groups are in the same place. July 3: I give a Dharma Talk at Clouds in Water Zen Center, St. Paul. August 20-21: retreat of some kind. To be determined. November 6: I give Dharma Talk at Northfield Buddhist Meditation Center, Northfield. May you be happy. May you be at peace. May you know the joy of your own true nature. Our work is to heal the mind of separation, the cause of our time’s unthinkable violence, and to ally with forces of nature to protect and restore the wholeness of life. Releasing human arrogance, with love and beyond conventional wisdom, we seek and follow guidance from those forces: land care, growing food, teaching, writing, retreats, and whatever is required. This is our intervention on climate catastrophe, while we prepare to offer hospice if needed. Working on a grant application, some things clarified themselves. The first paragraph is above. A key clarification is that the alliance with all beings is in fact the center. The land is a learning center, a place to begin that relationship, and a place to take in climate refugees if and when that happens. But the most important thing is changing our relationship with the rest of the planet – collectively. Thus, when asked “what if you don’t get the funding you need?” I answered that the shape of the work will change, but it will continue. Please look here, for better language. Reading the first few paragraphs will be plenty for most people. we “finished” pulling buckthorn and earned a cost-sharing grant from the National Resource Conservation Service. It was supposed to cover half our costs, and did about that. I’d hoped all that volunteer work would actually bring income, but we finished it with paid labor, and I’m not sorry. 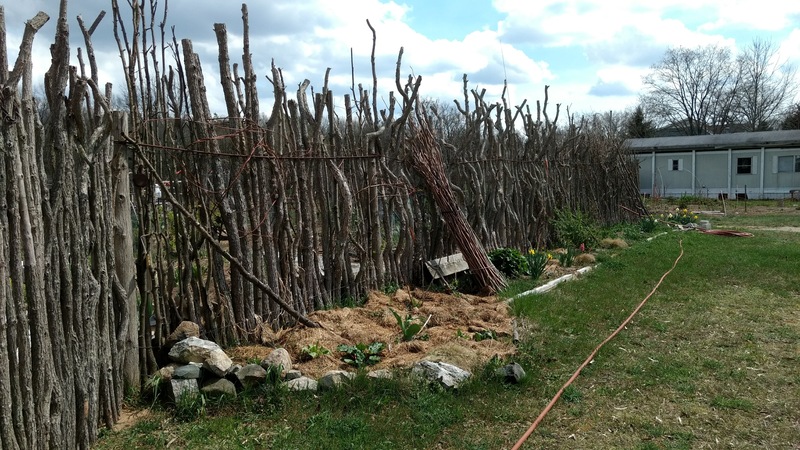 We planted some trees, ferns, and so forth, and there’s more work to be done there, but it’s alive with wild plum, willow, oak, black cherry, and lots more. The process of pulling and cutting all those trees has set me back. How can I claim to be listening to the forces of nature while warring on some of them. I have said, I’m on the side of balanced natural communities and removing the invaders – removing the plants that act like us, actually – but it still puts me at war. I’m gently considering communication with all the plants, not just the ones I like, and we will see where that goes. I committed to learning from all beings, to abandoning human superiority – and here I am. Tomorrow I visit my friend Setsurin McCarthy, who is walking across the continent. I meet up with her in Des Moines, the closest point. Unfortunately I don’t have time to walk a few days with her as I have hoped. A week later I visit my teacher for ceremonies – he’s appointed a successor – and also visit my old friend in prison there. A Zen student arrives in June for a few months; I expect another shortly after he leaves in the fall – good news, not to be alone here. This is meant to be a place of community. June 12, flower essence workshop here with Martin Bulgerin. I expect this to help me listen to the plants, as did April’s voice workshop with Myo-O Habermas-Scher. And I don’t even know what’s happening in today’s election. The solar panels are up and waiting for the inspector. In India, people are dying from extreme heat. In Alberta, the wildfire rages on. Temperatures are changing. Electoral politics is tragic. The names on my altar, of people recently passed, includes both Blanche Hartman and Daniel Berrigan. The heroes and heroines of my youth are leaving, gradually, as I finally learn to be an adult. I also imagine an entirely different relationship with the plants we harvest to eat, different from trying to destroy them; imagine they are willing to support us. So I’m checking out the wild parsnip, and studying garlic mustard, as I wait for strawberries to move from bloom to fruit. And, oh yes, some of us planted garlic and chives and strawberries under the orchard trees, and removed some of their tubes, and we begin to encourage a lively community in that area as well – wishing for more comfrey, some borage, some rhubarb, and whatever the usual plants are for the fruit tree guilds. All in time, in time. And, oh yes, a hundred million potatoes, half planted, because I didn’t eat them all last winter and now they sprout. Mints and catnip and lemon balm, bravely planted in the area where nothing will grow except weeds. Promising to harvest them, if they’ll grow. 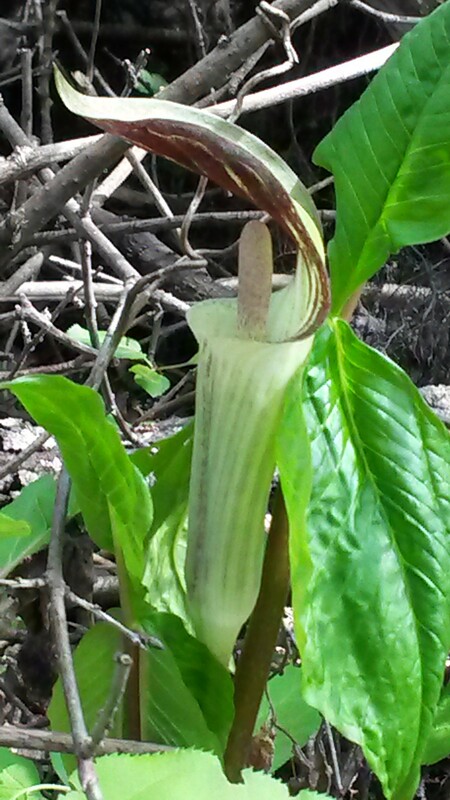 The Jack-in-the pulpit is still in my mind. I think I should make a flower essence from it. When I walk through the woods or fields, it seems as if I can hear all the plants, like a community of different voices, together, and they ask me to slow down and listen more, and I am too busy. It’s a story, even though it feels more real every day. But we live in story, not in the Absolute, and this is a story that seems a good way to live. So I don’t say “true” or “false” but just let it be there. My old Zen friend Luca has been visiting for two weeks now. He’s fixed several things, sharpened tools, and finished the impossible job – removing the staples from some beautiful oak flooring that I recycled last year. And we talk Dharma, and I try to let my busy mind slow down so I can just be here for that conversation, that person. He’s brought a very interesting awareness to my groups of friends, activist groups, young people living in commitment. He asks questions, and gives respect, and it’s very interesting. Some of us looked at the moon and Jupiter through his telescopes on a dark clear night. I never know what will happen next. We’re halfway through our visit. The flower essence workshop is being moved, because there are four people (including me) who definitely want to come and we can make that happen. I’ll announce the new date. Maybe others will come too. But this Sunday to Wednesday, we’ll sit sesshin in a new way. My usual is Antaiji-style: just sitting, no chanting or services or work, just face the wall. This will include Dharma conversation, a rest time, work practice, and an option for outdoor meditative practice as well as indoors on the cushion. There will be two or three of us – like a crowd, as usually I sit alone. It will be my rest time. Both June and July retreats are canceled because I will be traveling; June, to my teacher’s temple for ceremonies and community; July, to a small “thinktank” and then a ten-day wilderness retreat which I hope will offer the rest and re-creation I need. October sesshin will be led by Lee Lewis, with a focus on environment, and will include working with the plants as part of our zazen. Love to you all. Good night.